In a large resealable plastic bag, combine the garlic, soy sauce, lemon juice, teriyaki sauce, olive oil, Worcestershire sauce, pepper, and salt. Add the chicken. Seal the bag and chill for 1 hour. Drain the chicken, discarding the marinade. Thread the chicken onto the skewers. 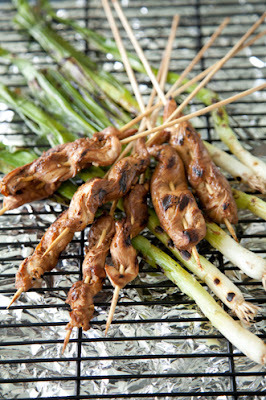 Arrange the skewers on the grill, and grill until the chicken is done, about 3 minutes on each side. Grill the green onions until browned, about 1 minute on each side. Arrange the green onions on a serving platter. Top with the chicken. Serve immediately.